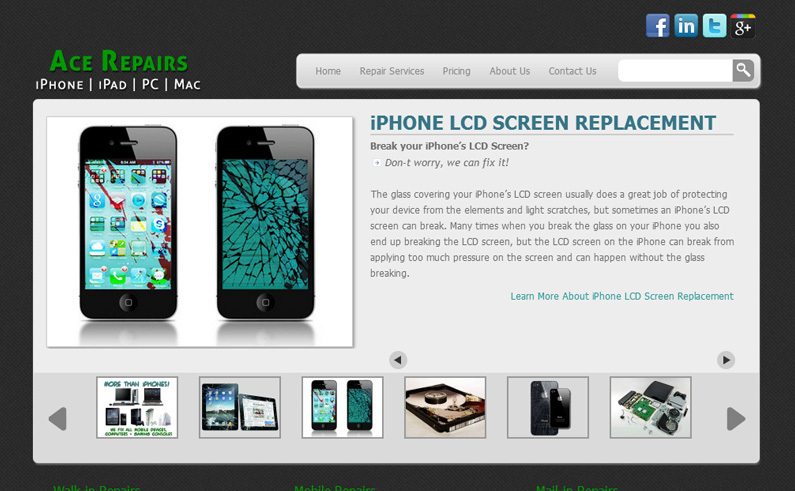 Eyeglass retailer in Cambridge, MA looking to expand their services to include computer repairs & iPhone repairs hired Riverine to help them develop a brand and launch a web presence aimed at people looking for iPhone repairs in Boston. Riverine was responsible creating an end-to-end inbound marketing platform for this small start-up and getting them launched. Work performed included web design, front and back-end development, copy writing and graphic design for all pages on this site as well as creation & optimization of social media profiles on Google+, Facebook, LinkedIn, & Twitter. Full results coming soon, in the mean time, check out this graph of organic traffic since we launched the site – no other promotion has been done…Small numbers but keep in mind it’s hyper local.